I am fortunate to live in an area with lots of good wine shops with tasting bars inside. Most Tuesday’s the Wine Gallery in Corona del Mar offers a special wine makers tasting bringing in wineries for select one night only flights. Back in September a German Riesling line-up was announced featuring the wines from Gunderloch and Reinhold. Unfortunately I was unable to make if on Tuesday for the 6 tastings with the representatives from the winery. The original flight was $28 and the pours are very generous. I was very happy to see they that they would be continuing to pour a selection of the flight for the full week! The wines varied from dry to medium dry and if you say you don’t like Rieslings then you haven’t tried the right one. 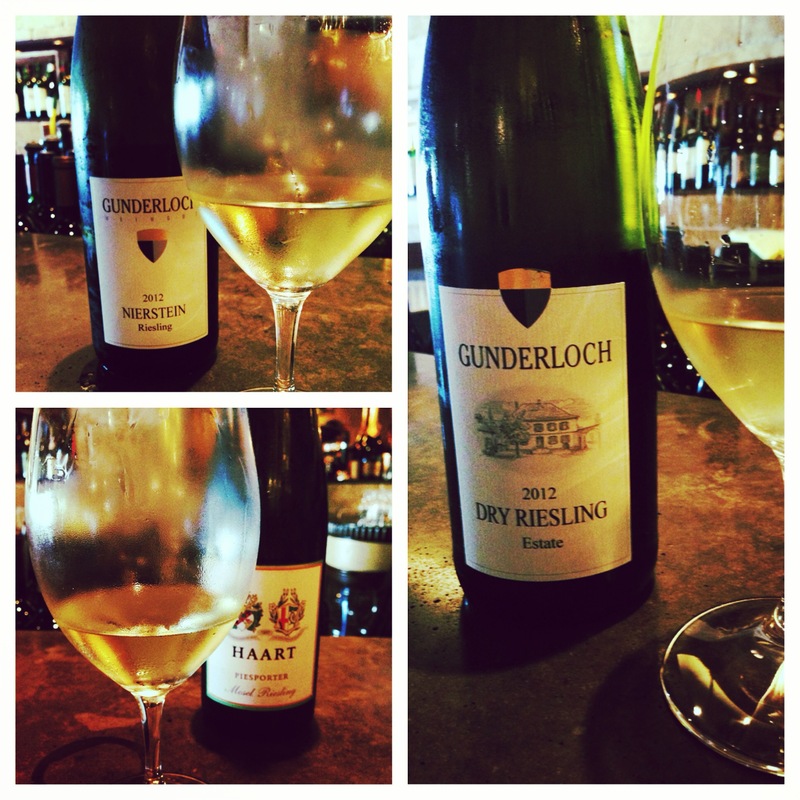 The flight started with the 2012 Gunderloch Estate Dry Riesling. This was more on the drier side of the wines tasted but still had the classic taste. It had a subtle oily yet citrus with mineral elements this was good for the price point of an entry level wine ($18 to take home). Next was the 2012 Gunderloch Riesling Dry Nierstein. This one was AMAZING! My friend- the big rocky cab drinker – was so close to buying a bottle of this one to take home for $25. It had a subtle fruit and nutiness from squash with stoney elements, the taste definitely had the minerality and citrus you would expect out of a great wine. According to the tasting notes, this be enjoyed for 5 plus years if stored corrected. Last on the modified flight was 2011 Reinhold Haart Riesling Piesporter – this was also enjoyable but was starting to get sweeter as this is classified as medium-dry for $15 take home. When I finished the 3 listed on the menu- I asked if they had either of the sweeter Reihold Haart wines still in the fridge. Jeff was able to find the 2008 Reinhold Haart Kabinett “EL” Piesporter Goldtropfchen. It was definitely on the sweeter side than the rest but equally nice and easily drinkable. I love the opportunity to experience new wines especially those that are not from California. Over the next year, I hope to grow my knowledge of “old world” vines. Growing up in California- it is natural to have easy access and understanding of varietal based. Now its time to learn some geography! Three of the four wines tasted – if I would have made it on Tuesday there would have been 6! Posted in Wine, Wine TastingsTagged cdm wine gallery, flight, german wines, Gunderloch, riesling, tuesday tastings, wine, Wine TastingBookmark the permalink.